Some people are capable of reading more than three sentences strung together. It's when long posts are quoted in full...zzzzzz. Back to the game, we saw Coll leave the ground, seemed to be lower back pain for him as he couldn't stand up straight. Just watched the highlights. Surely the keeper should have being sent off as Austin was one on one with him? It's called giving a report of the match in some form in order to give everyone some sort of perspective on the game. I didn't know you wanted a Twitter style report limited to a small amount of characters. Actually hats of to the likes of Caley Stan and Rig who took the time to write their informative posts. Haha can they not just cut to the good bits just as well they're not journalists be no room for any other stories! No as he was making a genuine attempt to play the ball. The rule changed about 2 years ago to stop the double punishment of a penalty and a red card. I'll draw some pictures for you next time bud. Ray Stewart, when he played for West Ham, very rarely missed and he was a defender. I recall he was once asked what was the key and he claimed he just run up and blootered the ball! The best players in the world have missed penalties so chances are we will miss pens too . 65% conversion rate could be improved on I’m sure , but expectation levels like your good self is unrealistic. I don't think it's unreasonable to expect full time professional footballers to be doing better than 65% for penalties. Maybe the first team players should have a look at the Under 18 squad. Three penalties awarded in their last two games and ALL converted! Yeah why dont we play the young lads on Saturday then? 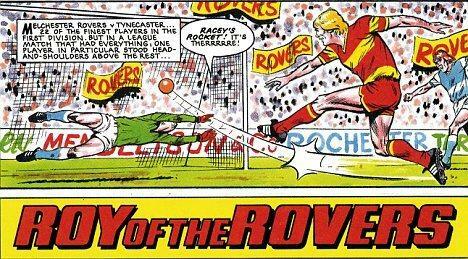 Melchester Rovers wonder if they'd swap Roy for Jordan White??? I think Ray Stewart hit the ball harder from the spot than anyone I can remember. Keepers didn't try to get in the way of his shots, they tries to get out of the way! It takes an exceptional player to consistently send the keeper the wrong way or to hit it so accurately that even if the keeper goes the right way, he;s not going to reach it. Keepers are always going to get lucky from time to time and the best way to make sure they don't get lucky to often is to hit the ball hard. We did great in the cup game but we really should have a better conversion rate for penalties in regulation time. Of course sometimes it is the penalty takers who get lucky! Saw this on the BBC website today. Exclude the penalty shoot out and we have missed more than half the spot kicks we have been awarded. That is not good enough and we need to be more clinical if we are awarded any more penalties this season. We should select two designated takers and have them practice for hours. Welsh is our first pick. Not sure who is second. Clearly it was White but he missed so then Doran. Donaldson could be the outsider as second pick. Hopw we’ve been practicising given the last two semis with Hearts have been settled on penalties.